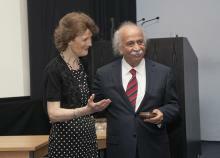 The 2013 Awards Ceremony took place at the Royal College of Art on Wednesday 1 May 2013. “Welcome to the Ceremony which celebrates the 35th year of the Sir Misha Black Awards and the 2013 Medal for Distinguished Services to Design Education. On behalf of my colleagues, Professor James Randle, representing the Royal Academy of Engineering, Professor Sir Christopher Frayling representing the College of Medallists, Professor Malcolm Garrett, representing the Royal Designers for Industry, and Joe Kerr representing this distinguished institution, the Royal College of Art, thank you for being with us. My job tonight is to tell you a little about Sir Misha Black and to introduce the speakers. There are a few of you in the audience who knew Sir Misha during his lifetime or will have heard about him at previous Award Ceremonies. Most of you are, of course, much too young to have known him. For you and for those of you who are attending this ceremony for the first time let me tell you, briefly, a little about him. Sir Misha was appointed Professor of Industrial Design at this, the Royal College of Art, in 1959 – some 54 years ago – a post he held until his retirement in 1975. It is fitting that we should gather in this building where he spent so many years and inspired generations of students. Misha Black was brought to London, at the tender age of two, in 1912. He came from Russia where the Czars still ruled, five years before the revolution that overthrew them. England became Misha Black’s country – he never lived anywhere else. He enriched it during his lifetime and his influence continues today. Your presence here confirms this. He was in the vanguard of those who encouraged collaboration in design education, by introducing subjects such as engineering and management studies into the industrial design course at the RCA. Sir Misha was very much a practising designer as well as a teacher. He was a founder partner of Design Research Unit, founded in 1943 when London was in the grip of wartime austerity, bombing, blackouts and rationing. Many would have considered the timing foolhardy but one of Misha Black’s great gifts was his innate sense of timing, whether as an intervention in an international debate or, as it proved, in the setting up of his design practice In the current climate of political and economic uncertainty, it might do well to remember that economic adversity or difficult conditions should not inhibit the creative mind. As Design Research Unit did in 1943, others might do today, and plan for a better future for all of us. Later, we will hear Professor Aranguiz Sanchez tell us about nurturing and developing design awareness and educating young designers during times of economic and political uncertainty. Sir Misha remained a key figure in industrial design and design education in the 60s and 70s. He was a Vice President of the International Council of Societies of Industrial Design, a Royal Designer for Industry and he served both as President of the Design and Industries Association and the, then, Society of Industrial Artists and Designers – now the Chartered Society of Designers – which is why these bodies are so well represented here this evening. Sir Misha died in 1977. The organisations to which he had given so much met and agreed that the most fitting tribute to his life and work was to recognise the vital role of teachers of design by establishing The Sir Misha Black Medal for Distinguished Services to Design Education. In 1996 the Royal Academy of Engineering joined in the Awards in recognition of the pioneering work of Sir Misha in encouraging design studies in university engineering courses. The first Medal was struck by the Royal Mint and presented to Sir William Coldstream by HRH Price Philip in a ceremony in Buckingham Palace in November 1978. (HRH returned to the College to present the 25th Anniversary Medal to Professor Sir Christopher Frayling in 2003). That 25th Anniversary year was marked by the establishment of the College of Medallists, as a group in its own right, and the Committee, may now seek the advice of the College on important matters. “So now to this the 35th year. As we gather to honour Professor Aranguiz Sanchez we recall past recipients of the Medal – the photographs of these distinguished design educators grace the wall of this theatre and in this way, they are very much part of our celebrations this evening. Collectively, they represent the pinnacles of design education in the 20th Century and for these early years of the 21st Century. Tonight I would ask you to remember particularly Dr Alex Moulton who died last December at the age of 92. Although he contributed to many engineering products and designed many bicycles, his name will be indelibly associated with the open-frame bike, with the little wheels, to which he gave his name, and for his work on the Mini, the iconic car of the 60s. He attended the Misha Black Award Ceremonies until he was 90 years of age, travelling from his home in Bradford on Avon. He gave our Committee much encouragement. He never lost his boyish enthusiasm for new ideas, new projects and new and better ways of doing old things. He was the epitome of an English gentleman and was indeed a gentle man. We shall miss him greatly. As we pause to remember Alex Moulton I would also ask you to remember Bill Moggeridge of IDEO. IDEO design became our Patron in 2005. Bill Moggridge, its co-founder, was a distinguished British Designer, a Royal Designer for Industry who established his own industrial design practice in London in the 1960s. He moved to San Francisco, one of the first to recognise the potential of, the then budding, computer industry in silicon valley. He designed the first lap top ‘The Grid’. His designs, his teaching – he taught here at the RCA – his publishing and his role in leading one of the world's most influential design groups brought him the respect and affection of the profession. He influenced 20th century industrial design on both sides of the Atlantic but I remember him too for his kindness and thought for others. Most of all, tonight, I remember when he walked through the door of this Lecture Theatre as a surprise to honour his colleague and friend David Kelley when he received the Medal in 2005. That was Bill – he travelled all the way from San Francisco to acknowledge a friend. In his memory let us always acknowledge and celebrate the achievements of colleagues and extend the hand of friendship. “We welcome and are honoured to have with us many of the Winners of the Award for Innovation in Design Education. I’m not sure if he answered his own question but tonight, my answer would be ‘a great teacher’. In an age where there is much self-centredness. good teachers remain selfless. Neruda also wrote: ‘The books that help you most are those which make you think most. The hardest way of learning, is easy reading, but a great book, that comes from a great thinker, is a ship of thought, deep freighted with truth and beauty’. Teachers are living books. “Now to the 2013 Sir Misha Black Medal for Distinguished Services to Design Education. Tonight I believe that ship has dropped anchor right here in London and delivered her precious cargo of the teacher whom we honour tonight. Professor Aránguiz Sánchez, you have been brave and followed Bernardo O’Higgins all the way to London. We are indeed honoured that you have and thank you and your family for making this long journey and we all welcome you warmly. This is the first time that the Misha Black Medal has gone to the Southern Hemisphere, a milestone indeed! “My thanks to everyone involved in organising this ceremony and to those who have taken part: to H.E the Ambassador of Chile, Tomas Muller Sproat and his colleagues from the Embassy of Chile, who have been so kind to us: to the Sir Misha Black Awards Committee for their dedication and work: to Wilhelmina Bunn our administrator, for her devotion to our cause; to the Founding Bodies for their support, to our Patrons Rolls Royce and IDEO and to the Ove Arup Foundation. Particular thanks to the Rector, Pro Rector and everyone at the Royal College of Art who help to make this a happy home for our Awards and to the technical team in the theatre this evening. The Sir Misha Black Award for Innovation in Design Education was not awarded in 2013.